Mini robotics for maximum fun and learning. The new fischertechnik Education Mini Bots have their own special approach to robots. The clever robot models can follow lines and avoid hindrances. Three nimble action robots can be made from actuators and sensors, such as IR trail searchers and push-buttons. 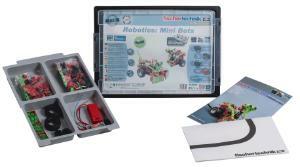 The Mini Bot programs are saved on the fischertechnik electronics module and can be adjusted with the DIP switches. Includes electronics module, IR trail sensor, 2x push buttons, 2x XS motors, and battery holder for 9V block battery (battery not included). REQUIRES: 9V Battery (not included).